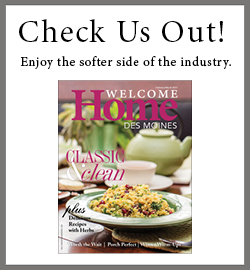 Why Is There a Shortage of Homes for Sale in Des Moines? There have been many opinions of this topic ranging from the economy, sellers lacking confidence, rising mortgage interest rates, and a correction in the national real estate market. 2008–2009 was an obvious turning point in the real estate market, but why did it take so long after the real estate bubble before the number of homes for sale dropped? So far in 2017, we are averaging just under 3,000 homes for sale, almost half of the inventory counts in 2009. After listening to local & national economists, as well as researching countless industry articles and reports, it finally became clear that many homeowners have lacked motivation to sell. Post real estate bubble, many home sellers had lower equity in their homes. Homeowners delayed putting their homes for sale while they evaluated their own personal home equity positions. Record low mortgage interest rates were not enough motivation to get sellers to jump into the market. Post 2009, home values had not yet began to rise, leaving home sellers with the prospect of making a lateral purchase. (Sellers typically move up in a price range not to a home of equal value). Some homeowners had put off completing normal upkeep and improvements during and immediately after the real estate bubble. Millennial home buyers became old enough to be able to enter the real estate buying market. However, the number of home residents rose as college graduating children struggled to save for a down payment and moved back in with mom and dad or had never moved out to begin with. In 2016, mortgage interest rates began to rise causing home sellers to do some quick math. Many sellers calculated that they could sell their current home for more money, but with the combination of the rise of mortgage interest rates and increase in home prices for the subsequent purchase, home sellers were yet again in a position of making a lateral purchase. As the economy continues to improve and home values rise slowly, we are beginning to see a normalization of our real estate market. The pace of sales will continue to grow in the next couple of years even if home buyers slow down a bit. There are some home buyers that are simply not even looking for a home until the inventory levels rise. The best scenario would be for a swing back to a balanced market, which I believe will not happen until at least 2019. It’s been a predictable first 5 months of 2017 with home sales mirroring 2016 numbers. All appearances indicate that we have also hit our annual peak in market activity. As summer arrives, we should continue to see home inventory increase allowing home buyers to breathe a little easier while searching for homes. As pending sale counts begin to slow, the Months of Inventory will begin to shift back towards a balanced market. The overall market slipped below two months of inventory in late March and has only broken above that two month mark this past week. The past two years, we remained in a Seller’s Market well into September. May has historically been the month when the highest number of accepted offers appear on the books. May 23rd of last year, the Des Moines Area Association of Realtors marked a record high count of pending sales at 3,246. We have yet to beat last year’s record high pending count, although we came very close this past week. 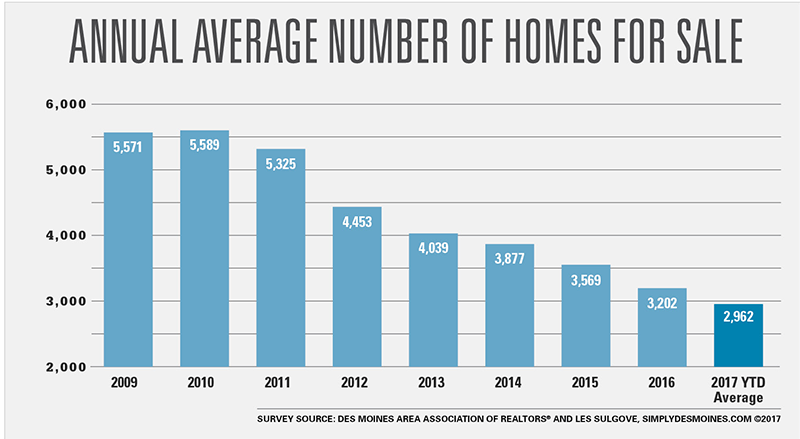 At the end of May, Des Moines real estate closed units are narrowly ahead of the same time a year ago. 2016 ended with 14,000 units closed and we should end the year very close to that number. The 30 Day Rolling Median Sale Price is also up YTD at $188,000. The Median List Price of homes for sale are $288,500 as of the end of May. The large gap between list and sale price is largely due to the higher priced new construction homes on the market above $300,000 and the bulk of actual sales occurring below $200,000.